The Open to Hope show features Dr. Phyllis Silverman, a bereavement expert who specializes in working with grieving children. While speaking at the Association for Death Education and Counseling (ADEC) organization, Dr. Silverman shares nine lessons she’s learned over several years of working in the industry. Currently associated with Massachusetts General Hospital and Harvard Medical School, Dr. Silverman has been an expert in the grief field for over 40 years. Currently, she’s studying what happens in families with dependent children when a sibling dies. First, know that death is a part of life—your own and others. 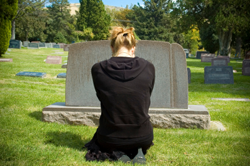 Years ago, Dr. Silverman says she wasn’t comfortable with even going to a cemetery. “Now, I think I can keep my eyes open and even be helpful to people,” she says. Second, the people you really want to help are your best teachers. Listen. Third, the boundary between the bereaved and professional is blurred at best. Humanity binds us, so there’s no them vs. us. Fourth, Dr. Silverman says death is a life-altering event. It’s not a condition and there’s no recovery, but it’s rather an expected part of the life cycle. Fifth, grief is an emotional event. It’s spiritual and social, not something you can do by yourself. It’s a family affair and part of a community’s heartbeat. For example, you can’t create a program just for children. There needs to be aspects for the family unit. Sixth, being human requires constant movement. Closure and recovery aren’t helpful words. Number seven is knowing that the linear model doesn’t exist in grief. You can’t anticipate what you’ll feel next. Eighth, not all grief is the same and there are many considerations. Each loss is unique. Finally, expanding your view of grief past emotional pain is paramount.